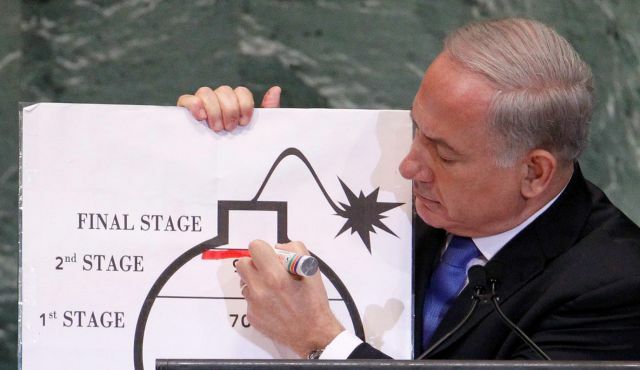 Israeli Prime Minister Benjamin Netanyahu addressed the United Nations General Assembly today and used a magic marker to illustrate his demand for American intervention in Iran's nuclear program. After ticking off the evidence that he says points to Iran's support of terrorism around the world, Netanyahu said that "given this record of Iranian aggression without nuclear weapons, just imagine Iranian aggression with nuclear weapons." And Netanyahu cast doubt on the theory that "mutual deterrence" would prevent a nuclear-armed Iran from ever using such weapons. He said it is "absurd" to suggest, "that a nuclear-armed Iran would actually stabilize the Middle East." "The hour is getting late, very late" to stop Iran from obtaining such weapons, Netanyahu warned. "We must face the truth," he added: Economic sanctions have not stopped Iran's nuclear program. What's needed, he said, is "a clear red line on Iran's nuclear weapons program." The red line that Iran must not cross, Netanyahu said, is "amassing enough enriched uranium" to produce a nuclear weapon.